The walrus is another example of improving environmental stewardship. Valued for its oil and ivory tusks, the Pacific walrus was subjected to intense commercial slaughter in the mid 1800s, and by the early 1900s, many worried they would soon go the way of the dinosaurs. Although population estimates have always been highly uncertain, as hunting was progressively limited, Pacific Walrus populations “increased from 50,000 to 100,000 animals in the late 1950s to more than 250,000 animals by 1985,” and they are believed to have now reached their maximum carrying capacity.557 As walrus numbers rebounded, they have crowded together at historic coastal haul-outs (Haul-outs are land locations where walruses congregate when not swimming). However some advocates are using the walrus’ recovery as evidence of ecological disruption caused by global warming and the loss of sea ice. But their fears would vanish if they had a more historical perspective. In 1923 Captain Joseph Bernard published an account in the Journal of Mammalogy about the inspiring conservation efforts he had observed in the village of Ingshong on the Siberian coast.558 There the wisdom of walrus conservation, dressed in the trappings of shamanic beliefs, had fostered a dramatic comeback in local walrus abundance. When Capt. Bernard had first visited the village of Ingshong, he met an ordinary hunter named Tenastze. Eighteen years later, Tenastze had become Chief. His rise to the top began when he gathered together the men of Ingshong and neighboring villages to discuss a decade of failed walrus hunts and disappearing herds. Walruses had once come to rest on their beaches in countless numbers, but the beaches were now empty. Tenastze believed that there was no one in the village looking after the spirit of the walrus and summoned a small group of shamans to peer more deeply into the problem. After days of extended drumming and an induced trance, the shamans reported that indeed someone had offended the spirit of the walrus and poisoned the land. To break the spell of evil, the people had to choose a strong chief who promised to guard the walrus’ spirit. 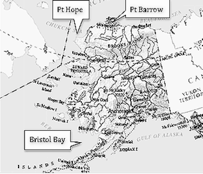 In 1925 Bernard again wrote in the Journal of Mammalogy, advocating for walrus sanctuaries in Alaska to the south of Barrow.559 He contrasted the more conservation-minded village of Ingshong to the settlement of Point Hope on the Alaskan Coast. Thirty years before, the walruses had hauled out by the thousands and some would even wander into town. However the traders, whalers, and Inuit of the settlement were all too quick to shoot any weary walrus coming ashore. Subsequently, for the last twenty years live walruses had become a rare sight on that beach. The European settlers of that time had embarked on a withering onslaught, motivated by a lucrative ivory market. In just a few decades the only surviving walruses were the ones that had learned to avoid coastal haul-outs, finding greater safety on the ice floes or more remote islands. Nomadic Inuit hunters showed no greater restraint than the Europeans. They followed the wary walrus herds out onto the ice floes. Although walrus meat was highly valued, ivory tusks brought much greater returns. Along the 200 miles of shoreline near Pt Barrow, Alaska, Bernard counted 1000 walrus corpses washed ashore. One third of the corpses still retained their tusks; although shot, they had managed to slip into the waters before the hunters could cleave their tusks. The nightmare was likely far greater than evidenced by mere shoreline counts. If Bernard counted 1000 rotting carcasses washed ashore by the westerly winds, how many more were carried by the currents out to the Arctic Ocean, or to other distant beaches? When the walrus were plentiful in the 1800s, they had hauled out in great numbers on beaches. Fay reported that of “numerous coastal hauling grounds that were used on the Siberian coast in the early part of the century, only three remained in use by the mid-1950’s.” There were just too few Tenastze to guard the walruses. Thanks to hunting restrictions, the walrus rebounded. As populations returned to historical peak abundance, they began returning to former coastal haul-outs. Most recently walruses returned to an Alaskan beach about 140 miles southwest of Barrow. It was the general location that Captain Bernard wanted protected as a walrus preserve, and news of the walruses’ return would have certainly caused the good captain to celebrate. But not the global warming advocates. 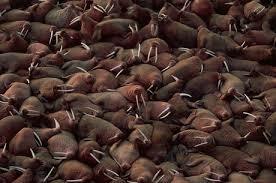 A stampede, most likely provoked by a hunting polar bear, left several trampled walruses. Although historically tramplings had been associated with great abundance, advocates spun it as proof of deadly CO2. In the heavy ice year of 1979, Fay examined the remnants of the greatest trampling tragedy yet recorded. On Punuk and St Lawrence Island, “At least 537 animals died at one haul-out area,” and approximately 400 other carcasses washed ashore from other locations. Nearly all of the dead were extremely lean, having less than half as much subcutaneous fat as healthy animals examined in previous years.” St Lawrence Island and the Punuk islands lie directly in the migratory path of the walrus’ southward journey from their summer feeding grounds in the Chukchi Sea to their wintering areas in the Bering Sea. The tramplings were spread out over both traditional haul-out locations on the Punuk Islands and in “four other locations on St. Lawrence Island where locals claimed they had not been seen in recent memory.” A more thorough investigation unearthed abundant old carcasses and bones and laboratory dating techniques revealed those “new” haul-outs had been very active in the early 1900’s before hunting pressures decimated their populations.